The bright pink flowers of the hibiscus plant get their color from the plant's high level of antioxidants. These antioxidants may deliver some benefits for pregnant women, but the plant may also influence hormonal activity, so don't consume hibiscus tea during your first trimester. There is no conclusive clinical evidence to support medicinal use of hibiscus and it should not replace conventional medical treatment. Discuss the risks with your doctor before drinking hibiscus tea. According to "The Handbook of Energy Crops," hibiscus is a flowering plant that grows in tropical and subtropical regions. It produces edible fruit and leaves, fibers that are useful for making burlap and a showy flower.The dried flower of the hibiscus is the main ingredient in hibiscus tea. Both the seeds and flower of the hibiscus may have medicinal properties. 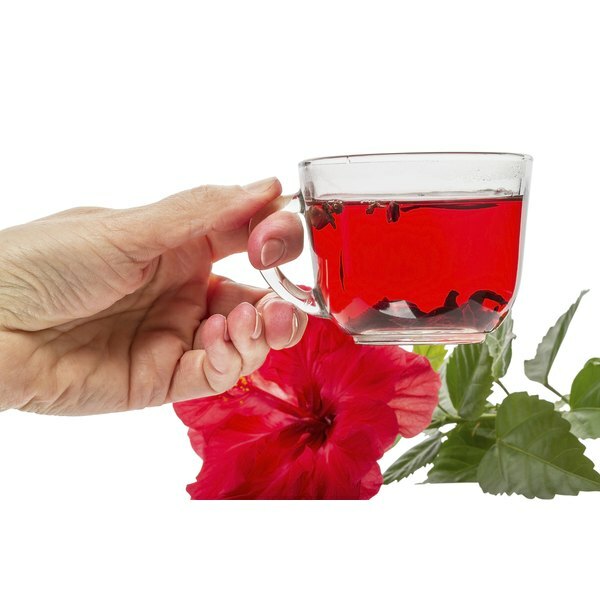 Traditional uses of hibiscus tea range from treatment for cancer to digestive disorders. According to the "Handbook of Energy Crops," an infusion of hibiscus flowers may help fight infectious organisms, cleanse the blood and lymph and soothe and tone the digestive tract. Conditions that it may help resolve include coughs, heart problems, high blood pressure and scurvy. Despite the tradition of medicinal use, there is no conclusive clinical evidence to support the use of hibiscus for these conditions. According to a study from the Guru Jambheshwar University of Science and Technology in India, use of hibiscus tea as a natural birth control goes back to ancient times. The study showed that hibiscus root extract may influence estrogen levels and prevent implantation and pregnancy. Avoid drinking hibiscus tea during the first trimester of pregnancy due to the herb's possible interference with hormonal activitY. After the first trimester, when the pregnancy is established, hibiscus tea may be safe for pregnant women and could deliver some potential benefits. According to the Bastyr Center for Natural Health, hibuscus tea is high in antioxidants, especially flavonoids. These special compounds help protect the cells of the body from damage by free radicals--toxic elements that may contribute to degeneration and disease in the body. Consuming high levels of antioxidants--such as those found in hibiscus tea--may help strengthen your immunity and other body systems and keep you and your baby healthy and strong. There is not conclusive clinical evidence about the benefits of the antioxidants in hibiscus tea. Traditional use of hibiscus to lower blood pressure may have some validity. A 2004 study published in Phytomedicine found that a daily cup of hibiscus tea has a similar effect to captopril blood pressure medication and may lower blood pressure by dilating the blood vessels, says the Bastyr Center for Natural Health. Blood pressure is often increased during pregnancy, and hibiscus tea might help lower it with minimal side effects. But there is not conclusive clinical evidence to support its medicinal use. Consult your doctor or midwife before drinking hibiscus tea. Handbook of Energy Crops: Hibiscus sabdariffa L.